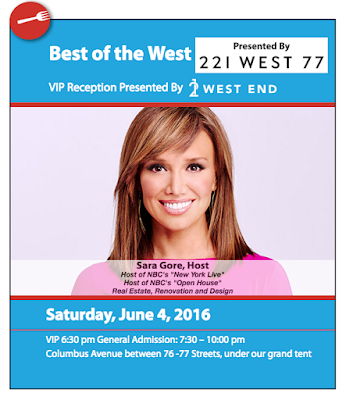 The 9th Annual New Taste of the Upper West Side is almost here! Last chance to get your tickets! This Friday and Saturday will include new and returning restaurants, notable chefs, and celebrity hosts for a delectable two-night celebration. The annual event, which was created by the Columbus Avenue Business Improvement District (“BID”), a 501(c)(3) not-for-profit, donates all net proceeds to the local community for neighborhood improvement and beautification projects such as the Columbus Avenue BID’s Sustainable Streetscape project, Theodore Roosevelt Park, Wellness in the Schools nutritional program, Greenhouse Classroom, Citymeals-on-Wheels and other beneficiaries. Dive into summer with everyone’s favorite surf, turf and seasonal favorites! 45 restaurants are re-imagining beloved warm-weather standards with unique and innovative twists. Senses are bound to be heightened in a beachy-chic setting under an exquisite block-long tent where the best flavors, scents and sounds of summer come alive to the rhythms of the Silver Arrow Band. Be the first to discover yet to-be named restaurant debut from two-time Michelin-star chef April Bloomfield with partner Ken Friedman (Spotted Pig, The Breslin); and Maison Pickle, the newest restaurant from the Jacob’s Pickles team. Other “firsts,” including neighborhood newcomers Jin Ramen, Han Dynasty and Playa Betty’s, will be joining dozens of returning event faves, such as Momofuku Milk Bar, The Meatball Shop, Jacob’s Pickles, Shake Shack and AG Kitchen. 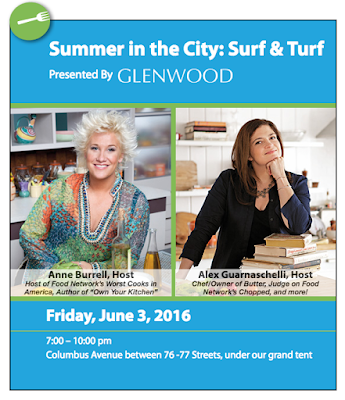 Hosting this star-studded evening are Anne Burrell, host of Food Network’s Worst Cooks in America and author of “Own Your Kitchen,” and Alex Guarnaschelli, chef/owner of Butter, judge on Food Network’s Chopped, mentor on Food Network’s All-Star Academy & author of “Old-School Comfort Food.” It’s a super soirée with international wine selections, craft beers, creative cocktails and so much more! The spectacular culinary weekend comes full circle with Best of the West 2016, celebrating the crème de la crème of Upper West Side cuisine for a ninth year! It’s an exciting evening of grand gastronomy against a backdrop of beauty, high spirits and the sophisticated sounds of Joe Battaglia and his 18-piece New York Big Band, as hosted by the charming Sara Gore of NBC’s New York Live and Open House. More than 45 fabulous Upper West Side restaurants are preparing unique and delectable dishes. Exciting neighborhood newcomers Crave Fishbar, Olma Caviar Boutique & Lounge, Orwasher’s Bakery and Amorino Gelato will be joining dozens of revered restaurants returning for yet another great year, including RedFarm, Boulud Sud, Dovetail, Jacques Torres and Rosa Mexicano. A magical feast prepared by Masters! For a second year in a row, New Taste of the Upper West Side is enhancing an exceptional experience with its exclusive VIP Reception, presented by 21 West End featuring a private lounge and bar, and Caviar Lounge by Olma Caviar. VIP guests will receive special gift bags with items from our sponsors. Most importantly, true devotees of the culinary arts will have early access to 45 of the finest chefs on the Upper West Side for an entire hour before general admission! This year’s sponsors include 21 West End, Argo, Glenwood, DNA Info, New York Post, West Side Spirit, Barritt’s Ginger Beer, Brusco Group, Rosa Mexicano, Cargill, Rishi Tea and Boston Beer Company. Get your tickets at http://newtasteuws.com/.